The best of the tropics! 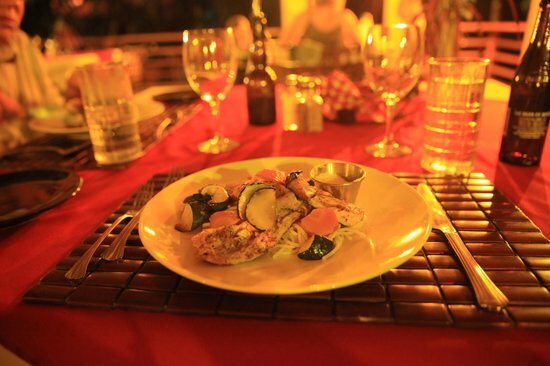 At Mystic River’s Restaurant “La Ranita” , dine in comfort at one of Belize’s best restaurants. In the mood for a relaxing meal? The view from Mystic River Resort’s dining room will leave you breathless! Come join us for breakfast, lunch and dinner at Restaurant “La Ranita”, “The Little Frog,” our in-house restaurant, where our chef will treat you to some of the best food to be found in Belize’s hotels. Most of our food was either grown or prepared right here on the property at Mystic River Resort. From our vegetables to our meats to our cheeses make sure you taste everything! Although we offer a diverse menu, ranging from Thai to local Caribbean and Latin American fare, please let us know if you have special dietary needs or if there is something special you would like us to prepare for you. We cater to all dietary needs as well as food allergies/likes or dislikes! Want to travel around Belize? We’ll pack a lunch for you. Whether you’re in Belize for ecotourism or adventure or just to relax, we’ll make sure you’re never hungry on your Belize vacation. In the evening, the dining room is the perfect place to relax by the fireplace with your newfound friends and exchange stories about your day. Don’t forget to send pictures to your family and friends using our wireless internet! Your perfect vacation is waiting. Contact us today!